Bright spark Harlie Haycox has become one of Britain’s youngest entrepreneurs after launching a restaurant - at the age of 11. 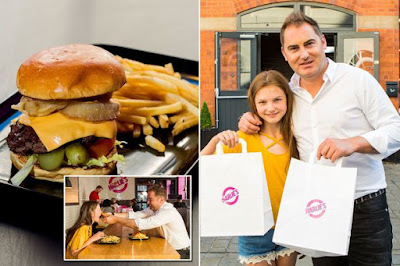 The schoolgirl came up with everything from the menu to the décor, branding and music at Harlie’s Diner after being inspired by her serial entrepreneur dad, Matt Haycox. With her father's financial backing, she also dreamed up the idea of having hot pink Chopper delivery bikes and serving Oreo-topped waffles with chocolate sauce. The all-American-style diner, in Leeds, celebrates her time living in Las Vegas, where she regularly visited diners and milkshake shops which were open late to accommodate the energetic nightlife. It was here, at the age of nine, she started to create her own holiday-themed milkshakes for the family business Sticks and Shakes, a store serving more than 500 milkshake flavours. Harlie said: “When we were in Las Vegas, we would import English chocolate bars because they were much harder to find and everyone loved them. After spending the best part of four years in the Nevada hot spot, Harlie returned to Leeds. She has drawn on her time in Vegas to create the US-inspired restaurant, which is family-friendly but also stays true to the nightlife of the city, staying open to the early hours. It serves an array of American classics, from beef patties and hot wings to shakes and waffles. The young tycoon enlisted help from school friends to sample the menu and select the best flavours for the US snacks and shakes, including loaded chilli cheese fries and Reece’s Peanut Butter Cup milkshakes. She also picked the colour scheme for the restaurant, which features a bright pink sign above the door and hot pink scattered among the interior. She’s even invested in fuchsia pink Chopper bikes to sit outside the restaurant, not only to give it an authentic American feel, but to also deliver her delicious dishes to the homes of Leeds. Harlie’s father, Matt, 37, is the co-founder of Harlie’s Diner and primary investor of his daughter’s new venture. » #BBNaija: Ex-big Brother Naija Housemate Uriel Has Launched Her Own "Cooking Show"